We’ve asked authors of books that were reviewed in the Oral History Review to answer 5 questions about why we should read them. In our latest installment of the series, Ann Bell discusses her Misconception: Social Class and Infertility in America. Read the review by Winnie Titchener-Coyle in OHR. 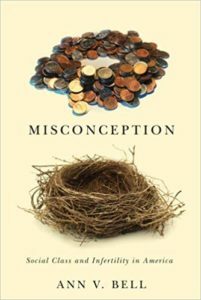 My book, Misconception: Social class and Infertility in America, is largely about the presence of stratified reproduction in the United States. What I mean by that is how groups are differentially prioritized when it comes to reproduction and parenting. These ideas play out in experiences of infertility (e.g., white wealthy women are considered infertile, while poor women of color are thought to be hyper-fertile, having too many children). The book explores how diverse women of various socio-demographics grapple with such ideologies across the spectrum of their infertility experience, including why they want to mother, how they live with infertility, and ultimately how they resolve and cope with their childbearing struggles. Misconception: Social Class and Infertility in America. By Ann V. Bell. New Brunswick, NJ: Rutgers University Press, 2014. 192 pp. Tremendously! I could not have written this book or answered my research question without the data provided to me by in-depth interviews. Trying to explore how and why social class shapes experiences of infertility is not amenable to a quantitative survey. Moreover, the personal, intimate topic of infertility does not lend itself to a focus group setting. Indeed, many of my participants confided to me that I was one of the only individuals they talked with about their infertility. Thus, my in-person conversations with the women were the ideal way to understand their experiences. The interviews yielded hundreds of pages of text, which I then had the privilege of reading and wading through in order to discover their stories. Oral history and the interviews contained within serve as an incredible research tool. The depth, nuance, and breadth of understanding one gains from this method is incomparable. It is an honor and privilege to hear someone’s story and then be trusted to reflect it honestly. Life is an exciting adventure, so hearing about others’ experiences is truly eye-opening and thrilling. This method allows you to meet interesting and wonderful people and learn about yourself along the way. Certainly not all methodologies allow for that. I hope for all of the reasons I state above. But also for the fact that while this is a book about infertility, its themes and conclusions inform a much broader understanding of motherhood, family, medicine, and social policy. It speaks to inequality, how and why it is present, and how individuals grapple with such disparity in their everyday lives. This is a difficult, but important, question. I can’t think of just one thing, but a few of the many things include: the presence of inequality in the U.S., how that inequality shapes our lived experiences, the potency of motherhood in the U.S. regardless of social status, the power of the medical institution, and ultimately the fortitude, agency, and power of women to persevere and make it through life’s challenges.